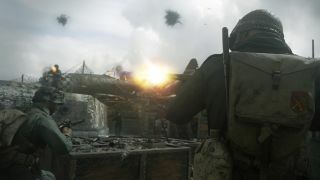 Call of Duty: WW2 isn't just a trip back to the '40s - its multiplayer component includes the V2 Rocket, a missile-shaped callback to the late '00s and Call of Duty: Modern Warfare 2's Tactical Nuke. Just be prepared for some legwork to unlock it. First, a bit of an explanation. When Modern Warfare 2 hit the scene in 2009, it introduced what would become a fan-favorite method of dispatching your enemies: the Tactical Nuke. By racking up 25 kills in a single life, you could call in this weapon of mass pwnage (hey, that word was still 'in' eight years ago) and immediately end the match with your team as the winners. CoD: WW2's V2 Rocket only kills anyone unfortunate enough to not be in cover as opposed to giving instant victory, but the build-up, method for using it, and devastation it unleashes all feel evocative of Infinity Ward's classic multiplayer. Since WW2 has only been out for a few days now, players are still double-checking exactly how to unlock it. But according to a pretty comprehensive Reddit thread and some dedicated players, it seems that if you want to take it for a spin yourself, you'll need to have Prestiged in all 5 Divisions at least once. Then, you'll need to secure 25 kills in a single life during a ranked online match - and keep in mind, kills made by using a different Scorestreak don't count toward that total. Should you manage this Herculean feat, you can call in the V2. Personally, I don't expect I'll ever get this reward. I'm just not good enough to Rambo my way through 25+ other players without dying. Still, it's a pretty cool weapon to see deployed, and you gotta respect those who are talented enough to earn it. Good luck on counting yourself among such skilled marksmen!